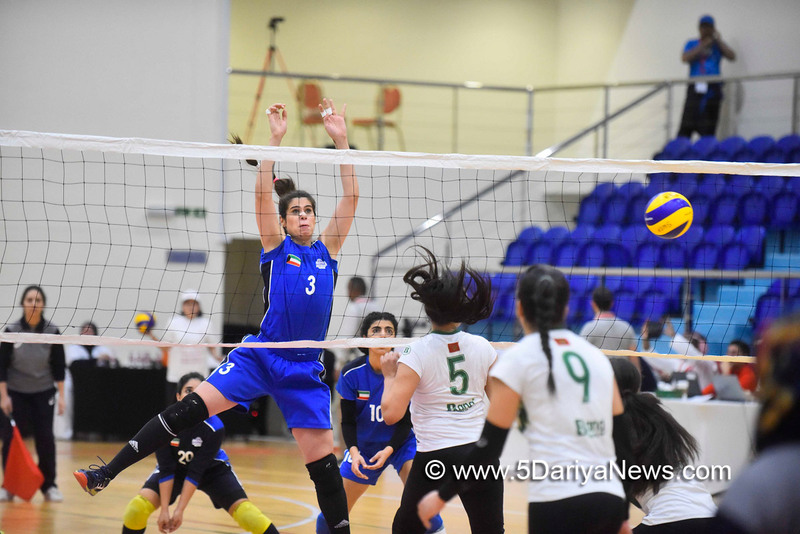 The hard-hitting volleyball team from Sharjah Sports Club for Women came up against equally ruthless opponents in the form Al Muharraq Club from Bahrain, as the match at the Arab Women Sports Tournament 2018 (AWST) swayed from one side to the other, eventually peaking in a final set decider where Sharjah just scraped home with a three-point win.The nail-biting match formed part of the fourth – and largest – edition of AWST, which runs until February 12 and is being held under the patronage of Sheikha Jawaher bint Mohammed Al Qasimi, wife of His Highness the Ruler of Sharjah, Chairperson of the Supreme Council for Family Affairs and Chairperson of the Sharjah Women’s Sports Foundation. From the start, it was clear to the crowds it was going to be a no-holds-barred contest, although despite Al Muharraq’s early steadfast defence Sharjah won the first set with a score of 25-19.The Bahrainis lifted their game in the second set knowing there was all to play for in the final stages of the volleyball event and won by a highly convincing 25-15, not only to level the scores at one set apiece but also giving the Sharjah ladies pause for thought and cause for concern.Going into set three, the confidence of their regained form kept the Al Muharraq Club on track for another win as Sharjah went down by 25-19, an improvement but still a way off the pace. At two sets to one down and on an apparent downward spiral, the ascendant Bahrainis just needed to maintain their momentum. With an early score of 7-2 up, it looked as though they had done exactly that – but Sharjah disagreed, going from five points down to two up at 9-7 in the blink of an eye. The power-shift was an incredible turnaround for the Sharjah ladies who defied all the odds and cruised to a relatively comfortable 25-17 win.The match had already been played at breakneck speed with a remarkable balancing act between the two sides and then came the final set, however, whichever team won, it was not going to be the perfect result they both hoped for; according to the technical regulations of AWST, if there is score of 2-2, the eventual tie-break winner is only awarded two points instead of three.Also in accord with the regulations, the tie breaking set is up to 15 points and not 25, making what was certain to be a death or glory match all the more tantalising for the spectators.Again it was a knife-edge set that could have gone either way with both teams seemingly dominant at different stages, but it was the Sharjah club who came through to win with a hard-fought margin, 15-12.The second match featured Morocco’s El Difaâ and Al Fatat from Kuwait and despite the possibility of an upset, the Moroccans never looked in danger of giving anything away, comfortably winning the match by three sets to nil (25-15, 25-18, 25-16).